These are the stories of my students. Men who came from Haiti and Africa to live, work and study in SÃ£o Paulo, Brazil. 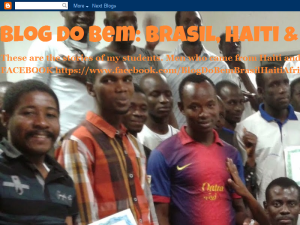 This what your Blog do Bem: Brasil, Haiti & Africa Blog Ad will look like to visitors! Of course you will want to use keywords and ad targeting to get the most out of your ad campaign! So purchase an ad space today before there all gone! POEMA: MINHA MÃE - Poeta: A criança preta do Mali, Adama Konate. Desculpe, Neymar. Mas eu torço é pelo Desenvolvimento e Progresso do Brasil. If you are the owner of Blog do Bem: Brasil, Haiti & Africa, or someone who enjoys this blog why not upgrade it to a Featured Listing or Permanent Listing?